"Atithi Devo Bhav" is a human truth, a symbol of Indian Hospitality. We treat our guest as good as 'GOD' and try our best to satisfy the guest at our level best. 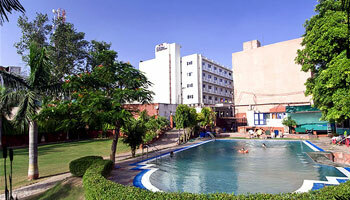 HOTEL "ATITHI™" is also one of those to keep the same standard. Located in the Tourist Complex Area, Taj Mahal (The Glory of Agra) is only at the walking distance. Hotel has 44 Luxury A.C. rooms. All are well furnished and designed to give you utmost comfort. The rooms are with attached bathrooms, Colour T.V., Hot & Cold water supply, Telephones and Refrigerator. Breakfast Services, Airport Transportation, Travel Counter, Laundry Facilities, Room Service, Security Guard, Currency Exchange, Doctor on Call, Parking, Backup Generator. DVD Player, Air Conditioning Room, Attached Bathroom, Toothbrush/Razor on Request, Cable/Satellite TV, Wakeup Calls, Iron/Ironing Board, House Keeping, H/C Water.